As you would've noticed, web apps are quite the rage right now. Actually, they've enjoyed immense popularity in a while. Which is why, there is no dearth of web apps in the world around us: There's Google Docs, Trello, Netflix, Pixlr and these are only a handful of the leading web apps in the world. The point is, web apps are essential for business. However, what can be challenging is deciding if you should go for an off-the-shelf app or go the custom web app development route. Sure, using a ready-made web app might seem like the better choice but take a moment and think if it can meet all your business' requirements. Every business, no matter the industry or scale, is different and thus, has unique needs. And it is why custom web app development is highly recommended. If you're thinking, "Well, that's not reason enough for me to opt for custom development,” allow us to list down the top reasons why you should choose this option. Among the most significant issues associated with ready-made apps is that it typically works on only one platform and device. Businesses need their apps to run on a variety of devices and OS, which means you need various versions of the app for at least every OS. Custom web apps efficiently resolve this issue since you can ensure they include support for as many platforms and devices as you deem necessary. A web app developed primarily for a business will be what it needs to address the challenges and issues it may be facing. 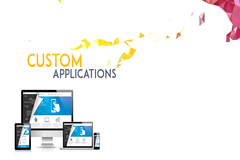 Custom web app development ensures the final product is built to serve the business' specific requirements successfully. Even if you manage to find a ready-made software that seems to be capable of tackling most, if not all, of your business’ requirements and challenges, it is highly unlikely that it will also be proficient in the context of scalability. A custom-built application will make sure that the app is capable of growing right along with the business and you won’t get cornered into buying expensive programs or licenses. As popular as off-the-shelf web apps might be, the fact remains that are also the most vulnerable to hacking because it is easier to find weaknesses in popular software. It is a major red flag when it comes to the security of your web app. However, hacking is rendered considerably more difficult with custom made web apps since it would take hackers a lot more effort as well as time to learn the program and identify its weak points. The reasons mentioned above should be enough to show exactly why it is a better idea for any business to build its web app instead of opting for a ready-made option. However, to harness the myriad benefits of custom web app development, it is essential to find an expert vendor who offers web application design and development services. This way, you can make sure that your business' web app delivers high-quality customer experiences and superior business results.